A Jellyfish trapped , alive , in a pool on the beach. Blue Jellyfish , "Cyanea Lamarckii". 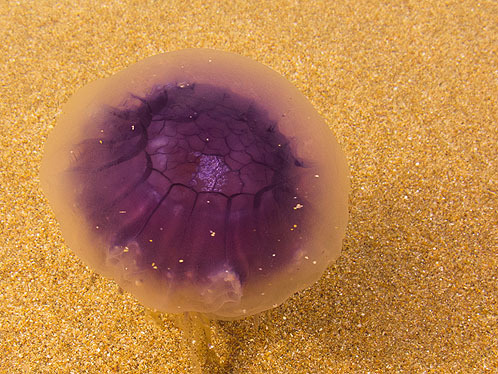 The stinging common blue jellyfish, arrive in Wales from May to October and grow up to 30cm in diameter and normally wash in dead in the autumn. It fishes the sea by swimming actively, letting its tentacles out and drawing them in again to eat the catch.